Until May 2017 this flight was operated by an Airbus A330-200, a long-haul aircraft and the same aircraft type that is sent to Frankfurt from Philadelphia. 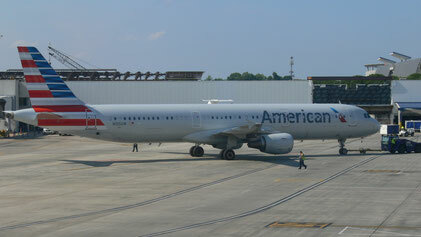 American Airines unfortunately operate this flight with Airbus A321 because of to little demand. The aircraft which should bring me to Miami was N523UW, an Airbus A321-200. 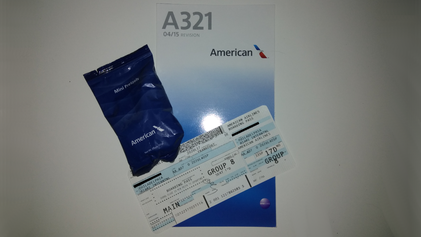 It was delivered to US-Airways in 2009 and made it's way to American Airlines in December 2013. I was one of the first persons on board and so I had the opportunity to take a closer look to the aircraft. I wasn't able to get a seat next to someone of my group but the worst message of the day for me was that there was no window seat for me but an aisle seat. When a mother of two teenagers asked me to change seats with her to sit next to her childs, I got a wonderful seat on the left hand side right behind the trailing edge of the wing. That seat was two rows behind the one I set before but it was totally worth it. Soon the doors had been closed, we were pushed back and the pilots started the engines. It was 4 pm and that is one of Philadelphias rush hours so we had to take a few more minutes of taxi on the branched network of taxiways. Like our earlier landing from Frankfurt, the takeoff would take place on runway 27R. Although our flight was on time, the air traffic controller gave us some shortcuts and we passed some waiting machines. About 15 minutes after our pushback we lined up the runway and we left Philadelpiha with TO/GA power (full power). After takeoff, the cabin crew gave us pretzels and beverages. Similar to many other airlines there are more younger flight attendents on shorter flights than on long haul flights. In contrast to other airlines our cabin crew was excellent; corteous and always with a smile on their lips. Onboard the A321 there was no Inflight Entertainment which wasn't bad, because the flight lasted just two hours. During the flight I did some sudokus and I had a nice conversation with a lady from Cologne, who flew to America for the first time. After I got my second beverage and we flew over Georgia or the northern part of Florida, I saw a the first indications of a thunderstorm and soon all passengers were requested to fasten their seat belts. While we passed thunderclouds consistently, the aircraft began it's descent. We continued our journey about 20nm inland so I had a marvelous view onto the east coast of Florida. Over Fort Lauderdale we turned to the west. On the left hand side there was a clear view of Miami Beach, Downtown Miami and the airport. With a sharp left turn we turned into final approach for runway 12 in Miami. The approach was a bit turbulent, because the pilot had to slow down our Airbus heavily. Our landing was soft and at the gate we were welcomed by a Boeing 777 with Oneworld Alliance livery of American and also by a pink pushback truck. When I left the plane, the purser thanked me again for my support before the takeoff with a german passenger, who did not speak english. Even though it was a relatively boring flight, it was one of the best flights for me in this year due to the conversations I had.